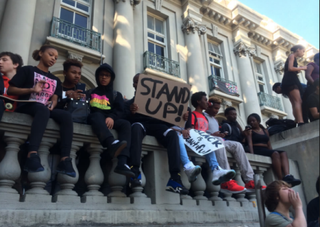 Berkeley High School students hold signs Nov. 5, 2015, to protest racist messages posted to the California school’s home page. More than 1,500 Berkeley High students staged a protest after a Web page made to look like the school's home page made references to the Ku Klux Klan and included racial slurs and threats against black students, including a note reading, "Public lynching December 9th 2015." According to the Contra Costa Times, students at the California high school walked out of classes around 9 a.m. Thursday and marched through the streets chanting. "Our school is where we're supposed to feel safe," senior Kaylynn McCoy, 17, told the Times. "On the streets, blacks already don't feel safe because of police brutality so … it feels like they attacked the whole community." Authorities told the newspaper that a 15-year-old Berkeley student admitted to creating the page, using a school-library computer. "I think it's terrific to be able to find out, and rare to solve something like this on the same day," Berkeley Police Officer Byron White told the Times. White added that the student was not arrested and that the case will be reviewed and likely given "to juvenile probation for review of charges. It's a juvenile suspect," the Times reports. Berkeley Unified School District spokesman Mark Coplan told the Times that school officials support the students' protest. "Everybody is appalled by what was placed on that computer—it was horrible, upsetting, degrading, outrageous and threatening," he said. "We are very committed to the safety and well-being of students and … we're trying to make sure they feel once again that school is a safe place for them to come." Coplan added: "Whatever is the maximum discipline that can be given in this case will be delivered." Read more at the Contra Costa Times.